Dolce & Gabbana Ad (With Chopsticks) Provokes Public Outrage in China : Goats and Soda In response to the three controversial videos, many Chinese are calling for a boycott of the brand — although Chinese ads aren't always respectful of other cultures, either. Despite its persistent rural poverty, China is a country of new wealth. And of ancient traditions. And as international brands seek to make money off of China, sometimes things go awry. In mid-November, Dolce & Gabbana, the Italian luxury fashion brand, launched three short videos on the Chinese social media network Weibo to promote its upcoming Shanghai runway extravaganza, dubbed "The Great Show," on Nov. 21. The videos feature an Asian woman in a lavish Dolce & Gabbana dress attempting to eat pizza, spaghetti and cannoli. With Chinese folk music playing in the background, a Mandarin-speaking voiceover kicks in: "Welcome to the first episode of 'Eating with Chopsticks' by Dolce & Gabbana" — pronounced incorrectly on purpose in a way that mocks Chinese speech. The male voice proceeds to mansplain how to "properly" eat the dishes. "Is it too big for you?" mocks the voiceover when the woman doesn't know what to do with the gigantic cannoli. "Let's use these small stick-like things to eat our great pizza margherita," he instructs in another video. "That's explicit racism," one person commented on Weibo. "D&G's stereotyping China. [The videos] only show the brand's outdated view about China." Some believe boycotting the brand is necessary. "If we don't kick D&G out of China now, there will be many other foreign brands trampling on our Chinese dignity!" said an angry netizen. D&G removed the viral videos from Chinese social media within 24 hours of posting them. The drama was not over yet, though. Just hours before the show, a fashion blogger shared a screenshot of an alleged chat between designer Stefano Gabbana and an Instagram user in which designer Gabbana appeared to call China a "country of [five poop emojis]" and "ignorant dirty smelling mafia." The screenshot went viral in China, along with the trending hashtag #boycottdolce. Within two hours, hundreds of Chinese actors and models who were to walk the runway that evening had withdrawn. D&G's Chinese brand ambassador, boy band star Wang Junkai, terminated his deal with D&G. Gabbana later wrote on Instagram that his account had been hacked — though his history of offensive comments meant his excuse was viewed with skepticism. An apology was also posted on D&G's official account, saying both accounts had been hacked and "we have nothing but respect for China and the people of China." It seemed the apologies came too late. That afternoon, D&G announced that the Nov. 21 show was canceled. Posts with the Weibo hashtag #DGTheGreatShowCancelled have been read 870 million times. Xinhua News Agency, China's state-run media outlet, asked foreign brands to respect the Chinese market. Chinese people in Italy appeared at the brand's flagship shop in Milan, protesting and demanding refunds. China's e-commerce giants, Alibaba and JD.com, removed D&G products from their online stores. 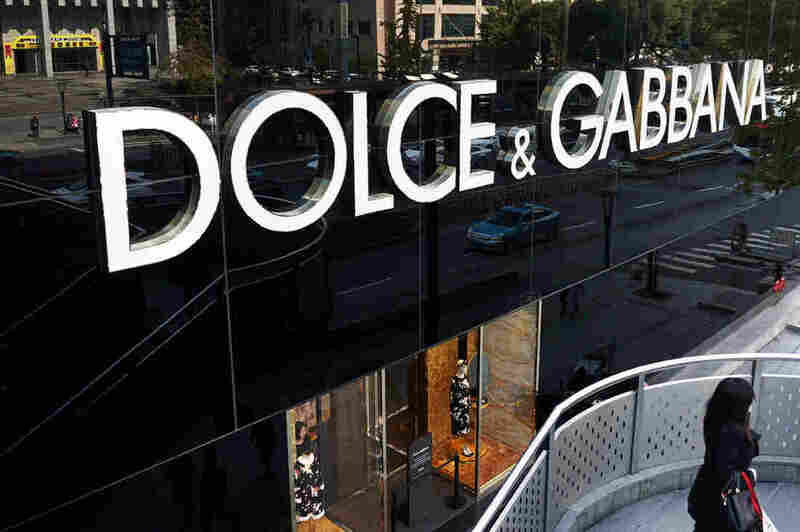 Hong Kong retailer Lane Crawford also halted the sale of D&G goods, both in stores and online, after customers started returning them. A Dolce & Gabbana store in Hangzhou, China, is among the nearly 60 that the luxury brand has in the country. A McKinsey report shows that Chinese consumers make up a third of the global luxury market. D&G has 58 stores in China; it's unclear how much damage this incident will do to the brand. Knowing that they "hurt the feelings of the Chinese" — a well-worn phrase often invoked by Chinese authorities when the country has been wronged — Domenico Dolce and Gabbana released a video on Nov. 23 in which they express their love for China and say "sorry" in Mandarin. Although China is the wounded party this time, the nation often turns a blind eye to racism. Some Chinese people call those with African heritage "hei gui" ("black ghost") and label Indians "a san" ("the third"), a derogatory term in the Shanghai dialect. In 2016, a Chinese detergent commercial featured a black man being thrown into washing machine and emerging as a Chinese man with fair skin. This met little resistance from the Chinese audience when it aired, and when foreign media outlets criticized the ad, the company was defensive. In the end, however, the controversial commercial was pulled.